I'm learning so much about myself through this experience of being published. I am stronger, more confident, capable of things that, four years ago, I would have said: never never never. I'm still shy, but I'm finding ways to work through that and come out the other side without egg on my face. My heart was still in my throat when I rang the doorbell at the gorgeous house on Lisa Jane Crescent on Sunday morning. But I showed up - so the battle was over before it even started. I tried to explain a book club to a friend. He didn't get it. Because why get together to discuss books? What's the point? But I'll ask this: why discuss anything? What about all those talks we have—sometimes with perfect strangers—about our favourite Netflix show? Or what about the way we dissect music, discern lyrics, argue meanings, and go to concerts hoping for a chance to get the bass player to sign our album? There's a beautiful value in community. That's why it's thrilling to sit in a stadium and feel the rhythm and excitement of a crowd vying for victory. Books do that for readers. And all an author really wants is to invoke some kind of emotion—something that stirs someone enough that they want to, need to, talk about it. Okay, maybe we're not keeping our fingers crossed for someone to paint our cover art on their naked chest and scream from the bleachers while they slop beer on the person in front of them, (though actually, that might help sales a little bit) but we do want to make something happen. The idea of someone curled up quietly with my book, sipping their tea or glass of wine, ceratinly creates a beautiful image for me. But I want more. Because a personal quest is lovely, but a journey taken with friends is divine. It would be like Cheryl Strayed going on her Pacific Crest Trail hike and then not telling anyone about it. Stories are not meant to be hoarded (like my secret stash of candy), they are meant to be shared. All we are is story. Why keep your cards so close to your chest? So...book clubs are a thing, and they should be celebrated. And if I wasn't so busy I would definitely be part of one myself. 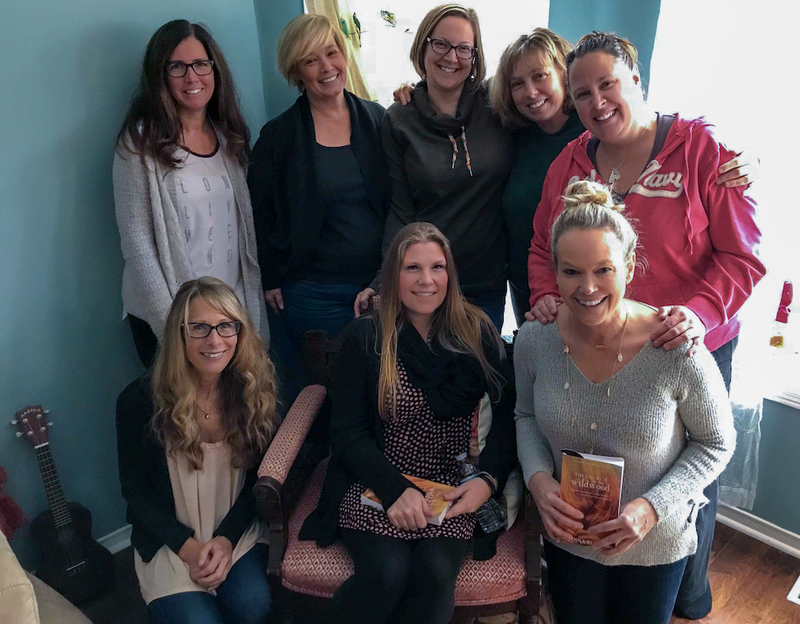 BUT happily, one great (unexpected) joy of getting a title out in the world is that BOOK CLUBS ARE READING IT and some of them even invite me to hang out with them! Last Sunday found me driving to the booming metropolis of Barrie where I was scheduled to visit a book club who had just read The Church in the Wildwood. I was nervous, but the host had assured me that they were "literally seven of the chillest laid back ladies you’ll meet". She was right! Everyone was warm and welcoming. It's wildly weird to be the centre of attention, but so affirming to hear how people connected to the story. When I finished, one of the ladies said, "You guys...the author of our book club book just read to us." And I felt embarrassed. But also a little like Margaret Atwood. They asked great questions, both about the story and about my process. There was interesting discussion about what happened to characters after the book ended, and I loved hearing all the theories. Just the fact that they cared enough to even wonder was a tremendous compliment. At one point, I was talking about Iris Carver and one of the ladies stopped me and said, "You made her up, but you speak of her like she's a real person you actually know." And friends, that right there kind of says it all, doesn't it?! "She is like a real person to me! I love her." 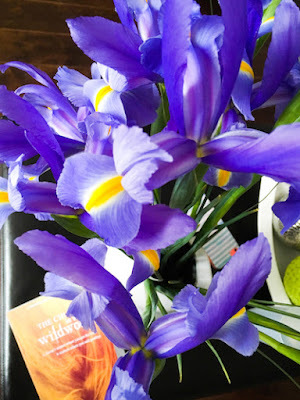 And before I completely let this post get away from me, it must be mentioned that Kim, the hostess of this make-me-blush gathering, had the book soundtrack playing in the background the whole time AND she had special ordered out-of-season irises in honour of the character Iris Carver. I mean...how amazing is that??!! This club keeps a memory box into which they put a memento of every book they read together. For The Church in the Wildwood, they had me sign one of the cover pages, which they tore out to include, and a rusty nail. Why a nail? BUY MY BOOK AND FIND OUT!! 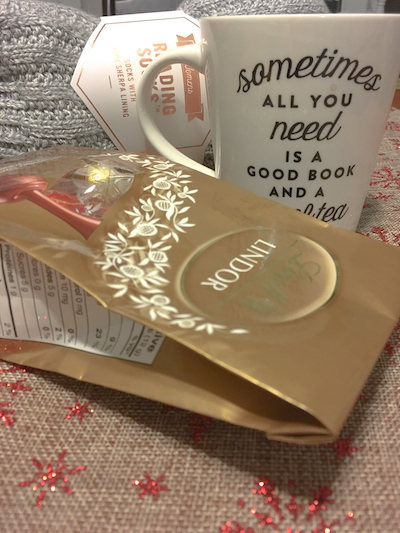 They sent me off with a thoughtfully curated gift that I will cherish...(well, not the chocolate...that I will savour...) and a happy little bubble of joy in my belly knowing that my pretty little book has made a pretty little dent in the lives of seven lovely women.